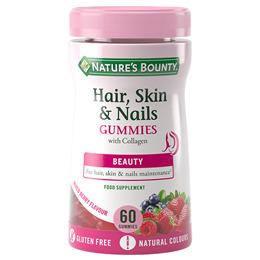 Nature`s Bounty Hair, Skin & Nails Gummies support your natural beauty regime. 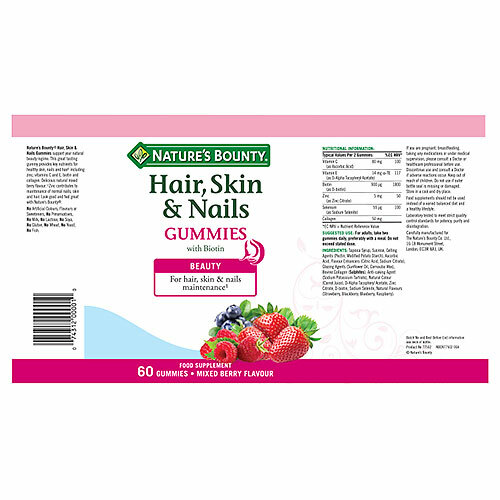 This great tasting gummy provides key nutrients for healthy skin, nails and hair including zinc, vitamins C and E, biotin and collagen. Delicious natural mixed berry flavour. Zinc contributes to maintenance of normal nails, skin and hair. 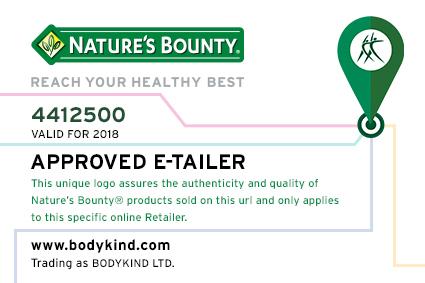 Look good and feel great with Nature`s Bounty. Mixed Berry Flavour. Tapioca Syrup, Sucrose, Gelling Agents (Pectin, Modified Tapioca Starch), Ascorbic Acid, Flavour Enhancers (Citric Acid, Sodium Citrate), Glazing Agents (Sunflower Oil, Carnauba Wax), Bovine Collagen (Sulphites), Anti-caking Agent (Sodium Potassium Tartrate), Natural Colour (Carrot Juice), D-Alpha Tocopheryl Acetate, Zinc Citrate, D-biotin, Sodium Selenite, Natural Flavours (Strawberry, Blackberry, Blueberry, Raspberry). For adults, take two gummies daily, preferably with a meal. Do not exceed stated dose. 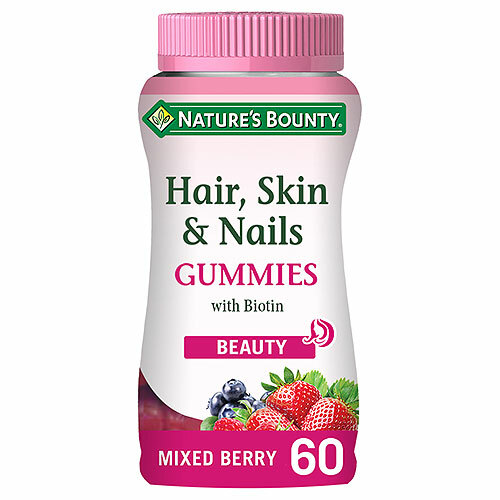 Below are reviews of Nature`s Bounty Hair, Skin and Nails - 60 Gummies - Best before date is 30th June 2019 by bodykind customers. If you have tried this product we'd love to hear what you think so please leave a review. 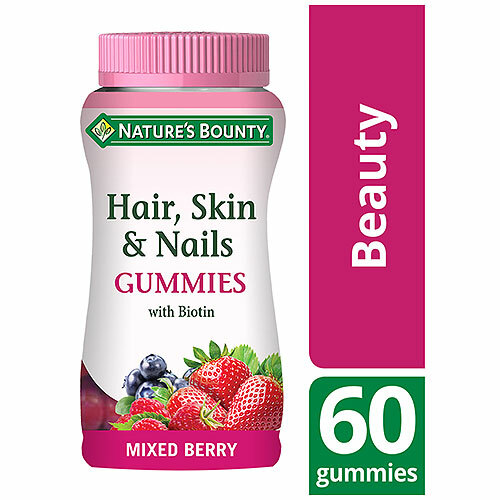 Nature`s Bounty Hair, Skin & Nails Gummies support your natural beauty regime. This great tasting gummy provides key nutrients for healthy skin, nails and hair including zinc, vitamins C and E, biotin and collagen.